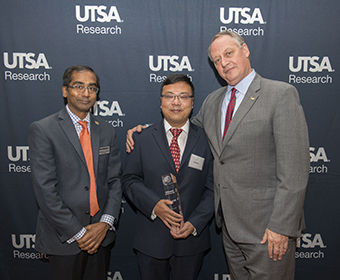 Bernard Arulanandam, interim UTSA vice president for research, Bing Dong, UTSA’s 2017 Innovator of the Year and UTSA President Taylor Eighmy. (Nov. 15, 2017) -- The University of Texas at San Antonio (UTSA) recognized UTSA professor Bing Dong as its 2017 Innovator of the Year at its fifth annual Innovation Awards. His selection was based on a number of factors including the launch of his startup, grant awards, I-Corps participation and licensing of his numerous technologies. Dong earned his Ph.D. at Carnegie Mellon University. Before joining UTSA in 2013, he was a senior research scientist at United Technologies Research Center. His current research interests include energy modeling, intelligent building operation, occupant behavior in buildings and buildings-to-grid integration. His lab, Built Environment Science & Technology/BEST, is interdisciplinary, combining mechanical engineering, artificial intelligence, electrical engineering, and social science research. In 2017, he received the UTSA Faculty Research Award for Highest Funding as Principal Investigator and a Distinguished Service Award from the International Energy Agency. He has published one book, ten book chapters, and over 50 journal and conference papers. Additionally, UTSA recognized 29 other members of its research community. Organized by the UTSA Office of Commercialization and Innovation (OCI), these annual awards are presented in four categories, reflecting UTSA’s success at commercializing new knowledge and technologies. “Our goal is to cultivate a research-intensive environment where our faculty and students can flourish and their research contributions have meaningful impact societally,” said Bernard Arulanandam, interim UTSA vice president for research. The OCI works with UTSA faculty to facilitate technology transfer and commercialization, and to assist with university-industry partnerships. Through the OCI, the university provides intellectual property management and licensing, proof-of-concept development, new venture incubation, entrepreneurial training, and policies and procedures that accelerate and ease the transition of intellectual property from the university to industry. “These awards recognize the UTSA research community’s accomplishments. By inviting key stakeholders from across the larger regional research network including industry and government partners, it is an opportunity for everyone to engage and find new ways for collaboration across various fields and interests,” added Christine Burke, director of Commercialization and Tech Transfer. Issued patents represent the securing of intellectual property rights for new innovations, which grows our licensing portfolio and contributes to UTSA’s state, national, and international rankings. >> An expendable scaffold that serves as a temporary template that allows damage tissue to be rebuilt. >> System used to access and control a laboratory experiment remotely. >> A roof sensor system to measure and transmit load information to warn of roof collapse. >>A statistical test to measure the quality of random numbers provided to a computer program. >>A series of new prototype metal organic frameworks that exhibit storage capabilities for multiple gases. >> A laparoscopic device used for cooling organs during surgery. >> A method used to lessen or render less severe chemotherapy induced infertility. >>Biomedical scaffolds used for treatment of bone diseases and bone repair. Licensing revenue represents income the university receives from intellectual property that has been optioned or licensed. The revenues are shared amongst the university, colleges, departments, and faculty involved in the intellectual property. In 2017, the National Science Foundation awarded six $50,000 grants to six UTSA investigators and their teams, with the goal to identify valuable product opportunities that can emerge from academic research. This grant also provides entrepreneurship training to the participants by combining experience and guidance from established entrepreneurs through a targeted curriculum. >>A NTV regulator module that lowers the voltage to lowest powers consumption setting, it can be drop-in the existing ICs that barely requires any additional silicon space or redesigning the core system. Demand of this NTV regulator fulfills low-power, low heat loss, long-life of ICs and longer battery life can be met very easily. >> A method for PCP and OB/GYN doctors to measure levels of a breast cancer biomarker in saliva that allows early detection (stage 0, I & II) of breast cancer in women with extremely and heterogeneously dense breast tissue (1 in 4 women), reducing mortality rate by and cancer care costs. >> InfraVein uses an infrared camera to make veins easier to detect, so that needle insertion is as simple and painless as possible. >> DashMessaging is a simplistic, user-friendly flexible messaging platform for fast deployment of variety of automated protocols. This platform saves time and money by reducing everyday administrative burdens. >> A UTSA based start-up company, Leaptran, Inc. offers innovative energy and wellness management systems (EWMS) for buildings and communities through sensing, energy optimization, machine learning, and behavior analysis. The UTSA Office of Commercialization and Innovation will also recognized UTSA’s latest inductee in to the National Academy of Inventors: David Akopian (2016). He joins Taylor Eighmy (2013) and C. Mauli Agrawal (2015). Friday, April 19, 7:30 p.m.
Friday Nights Celestial Lights - Exocomets!